Kaylin Bukowski of Sparrows Point battles a Catonsville player for a head ball. Sammie Bennett scored what turned out to be the winning goal during Sparrows Point’s 2-0 win over Catonsville. Sara Gruntowicz prepares to pass the ball inside during Sparrows Point’s win over Catonsville. Kalli Bell scored a goal during Sparrows Point’s 2-0 victory over Catonsville on Monday. Makenzie Hausner goes up for the ball during a corner kick against Catonsville. Emalee Travagline attempts to force the ball through a Catonsville defender while in front of the goal on a corner kick. There was a time when Sparrows Point and Catonsville met in the Baltimore County championship game in back-to-back years (2013-14), with each team winning one game. 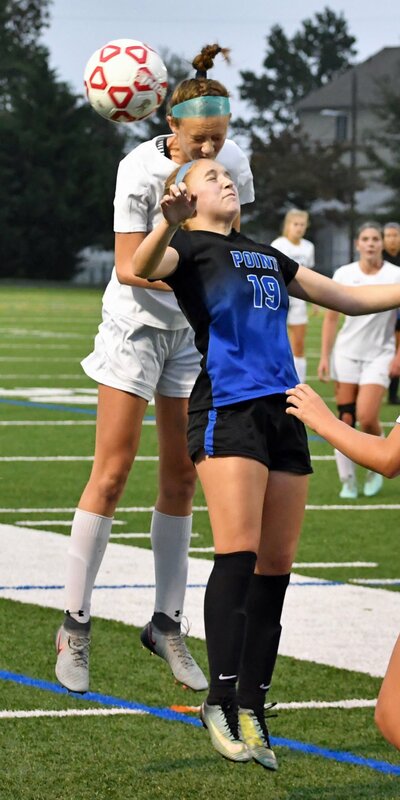 The stakes weren’t as high when the Pointers hosted the Comets on Monday, and neither was the tension as Sparrows Point posted a methodical 2-0 victory. Despite the closeness of the score — Sparrows Point led 1-0 at halftime — the Pointers never seemed to not be in control of the game. The only time Pointer goalkeeper Jaddah Foos seemed to touch the ball was picking up the occasional stray pass that rolled down to her end of the field. Still, the Pointers (5-0) could never relax in their first game since beating Perry Hall in overtime one week earlier, and their second straight close contest after opening the season with three easy victories. “We’d rather play a tight game,” Sexton said. “It’s not fun to play a 12-0 game. We were able to work on finding our teammates and making sure our passes were good. We still need to work on reading each other. Sparrows Point took a 1-0 lead with 23 minutes left in the first half on a goal by Sammie Bennett off an assist from Dezirae Mortimer. Kalli Bell made it 2-0 early in the second half, with the assist again coming from Mortimer. Sparrows Point was to host Parkville on Wednesday. The Knights, having moved up to Baltimore County Division I after winning Division II last season, have been having a rough season. The Pointers then travel to Loch Raven on Friday, and host Patapsco on Oct. 3 in Sparrows Point’s Senior Game. The Patriots (1-2) lost at Hereford on Friday, 12-0 and host Catonsville on Friday. Dundalk (5-1) lost its first game of the season, falling 5-0 at Franklin on Friday. The Owls still share the Baltimore County Division II lead with Kenwood, Franklin is a Division I team. Dundalk was to host Randallstown on Wednesday and play at Kenwood on Friday at 5:15. Sparrows Point (2-4) lost at Perry Hall (coached by Pointer alumnus Brittani LaFollette) on Monday 5-1. The Pointers lost to visiting Hereford 8-0 on Thursday. Sparrows Point was to play at Towson on Tuesday and at Loch Raven on Friday before hosting Franklin on Oct. 2. Patapsco (3-2) beat host Lansdowne 2-0 on Monday and defeated host Chesapeake 7-0 on Friday. The Patriots play at Kenwood on Friday and host Owings Mills on Oct. 3.